The archipelago of Fernando de Noronha lies in the Atlantic ocean, about 360 km from the city of Natal, being the eastest inhabited point of Brazil. The volcanic archipelago is both a beach and eco-tourism destination. Year after year the beaches of Fernando de Noronha are among the most beautiful ones of Brazil and thanks to the rich marine life of the archipelago it’s with no doubt Brazil’s best diving and snorkeling spot. 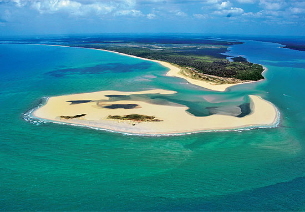 The only way to reach Fernando de Noronha is by air and the connections from the continent leave either from Natal or from Recife. The flying time is about an hour. Fernando de Noronha applies a tourist tax which can be paid before arrival via internet or at the airport. The amouth of the tax is about 33 R$ per day and to avoid queues, we do recommend you to pay the tax in before hand. Basically all the pousadas (=brazilian guesthouse) include airport transfers in the basic price of the stay, so therefore you do not need to worry about the transportation once you arrive to Noronha. 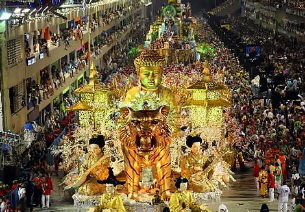 At the airport you will meet a large number of agencies offering tours and activities. It’s a good idea for you to pick some brochures in order to get an idea of all the activities available in the island. When talking about Fernando de Noronha, it’s good to remember that we talk about a National Park and the fragile nature of this paradise island is highly protected. For an ordinary tourist this means that you will probably not find any other cleaner beach from Brazil than the beaches of Fernando de Noronha. On the other hand, it’s also good to remember that you will also be responsable of keeping them clean, otherwise high penalties will apply. 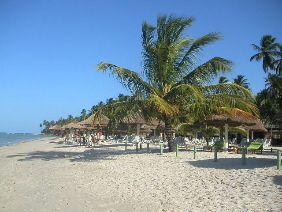 Don’t expect to find a hotel located right on the beach, nor beach servicies with chairs and bars. At Fernando de Noronha the beaches are protected and no building are allowed on the beach. 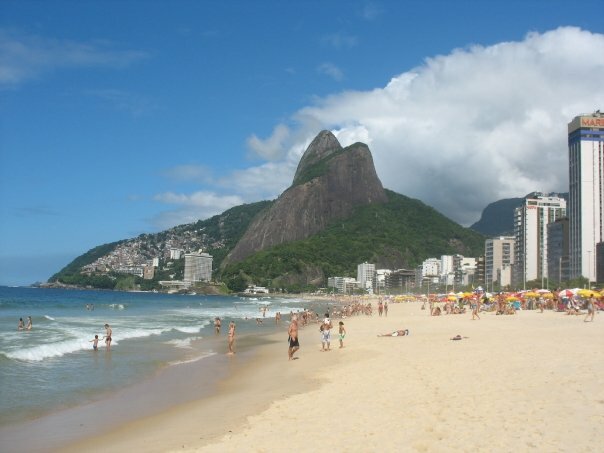 Basically the only so called “beach bar” can be found from the beach of Praia do Meio and the centrally located Praia do Cachorro may have locals selling drinks and light snacks as well. 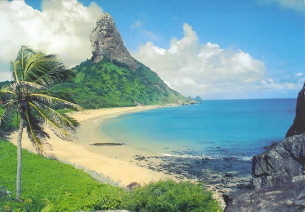 The three most beautiful Brazilian beaches (rated by the Brazilian authorities) can be found from Fernando de Noronha. 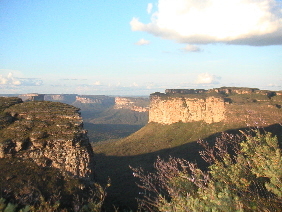 The number one, Baía do Sancho, can be reached either by sea or by descending ladders hanging in between two rocks. This color of water is a mixture of turquoise, green and light blue, and you may observe a large number of tropical fish while swimming or snorkeling around. 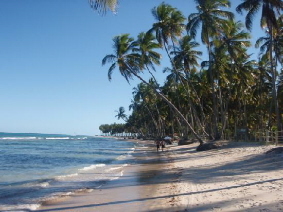 The second most beautiful beach is Baía dos Porcos, located next to Baía do Sancho. 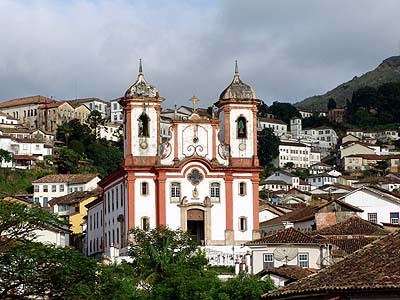 Both of them offer some most espectacular views over the coast and the sea. 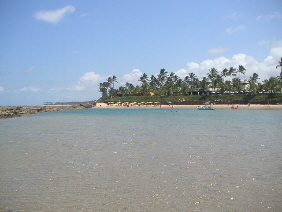 Baía dos Porcos, which is located in front of the famous rocks called “Dois Irmãos“, has a number of natural swimming pools and it also excellent for snorkeling. 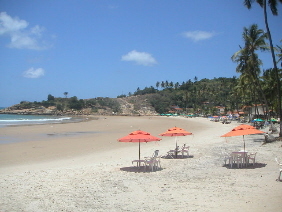 The last but not the least at the top three is a beach called Praia do Leão. This beach, located in the southeastern part of the Fernando de Noronha is the longest one of the island and the color of water is deep blue. This is where the sea turtles come to lay their eggs on the beach. To reach all these and many other beaches for the first time it’s recommendable to have a local guide with you. One of the most popular excursions in Fernando de Noronha is a tour around the island, which takes you to all the famous beaches and ends up to being an excellent way to get to know the island. The main attraction of Noronha is the nature, especially the under water life. This makes the island to be the best diving and snorkeling destination of the country. Some of the best beaches to observe the marine wild life year around are Praia Atalaia and Praia Sueste. 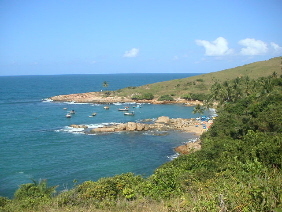 Praia Atalaia is practically a natural aquarium and located within the National Park area. That’s why a limited number of person (30) is allowed to visit this it on daily basis. Praia Sueste on the other hand is the calmest beach of the island allowing diving and snorkeling at any time of the year. Like all around Fernando de Noronha, here diving is also limited to certain areas in order to protect the coral reefs. The island of Fernando de Noronha is also very popular among surfers, being the beach of Conceicão one of the best options for surfing. 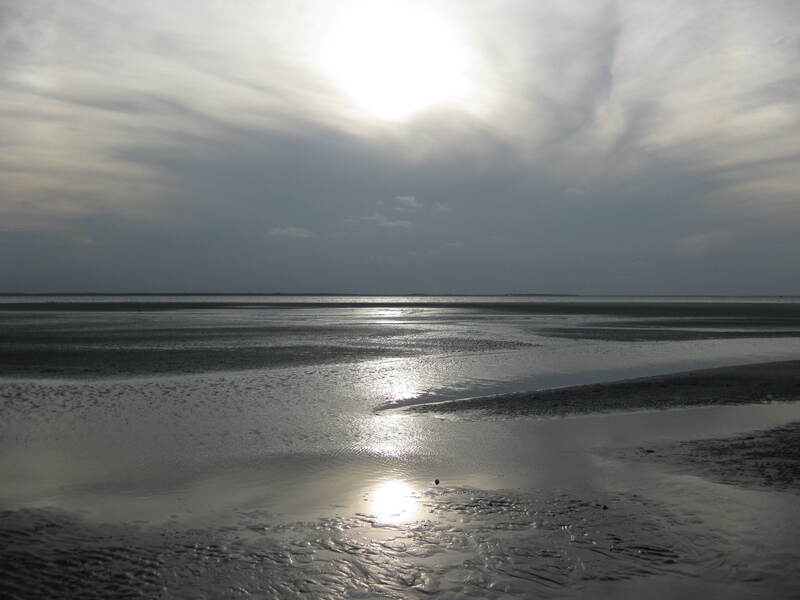 The wawes are ideal from December to February and this is also one of the best points to enjoy spectacular sunsets of the island. For those that are not into water sports Fernando de Noronha offers options for hiking, horseback riding or deep sea fishing. 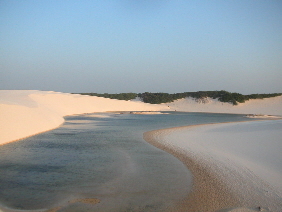 Dolpins can be seen either early in the morning at the bay of Baía dos Golfinhos or day time during boat excursions organized by the travel agencies. Check out our itinerary suggestions including the island of Fernando de Noronha. 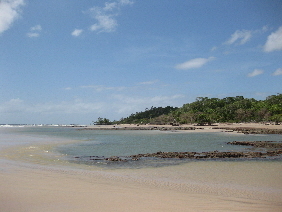 Pousada Algas Marinhas – a small pousada located in Floresta Nova, close the to village of Vila dos Remedios. 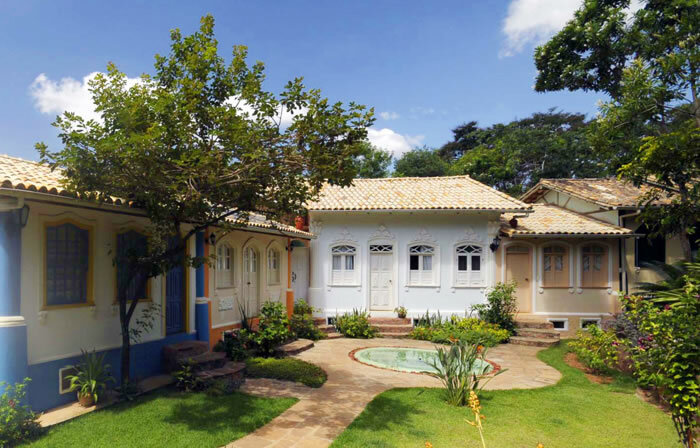 Helpfull staff together with rooms decorated with good taste and quality materials makes this pousada an excellent value for money. Pousada Solar dos Ventos – wooden bungalows located in the southern part of the island with views over the the bay of Baía do Sudeste. An excellent choice for those willing to have full privacy during their stay. 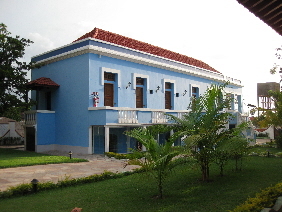 Dolphion Hotel – Dolphin offers hotel standard accommodation with rustic charm of pousadas respecting the surrounding nature. 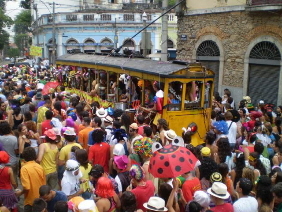 Location just a short step away from the landmark of Noronho, Morro do Pico. Pousada Zé Maria – If you want to spoil yourself with the best that Fernando de Noronha has to offer choose Pousada Zé Maria with prime location on the island.